A new mural giving a whimsical nod to Sunnyslope’s past will be celebrated beginning at noon on Saturday, Dec. 15, at the Sunnyslope Historical Society Museum, 737 E. Hatcher Road. The mural, crafted by Valley artist Tim Medina, is on the west-facing side of the museum, which is housed in a building that was originally the People’s Drug Store—the first drive through pharmacy in Arizona. 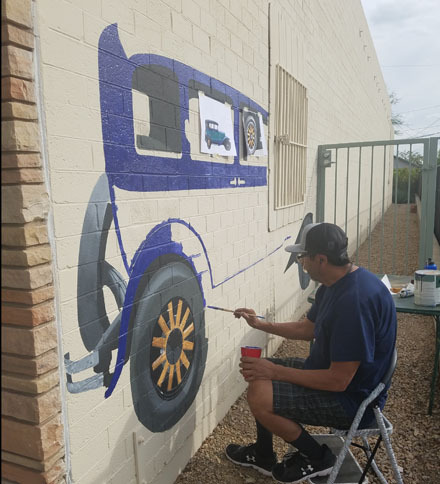 Valley artist Tim Medina begins work on a mural located on the west side of the Sunnyslope Historical Society Museum (photo courtesy of the Sunnyslope Historical Society). Medina began painting the mural at the end of September, putting in about 40 hours of work before completing it in early November. Medina’s portfolio ranges from portraits, to detailed automotive airbrush, to large-scale murals. He currently has a mural on the back of the Armored Mini Storage facility south of Glendale Avenue, just east of 16th Street and adjacent to the Arizona Canal. The museum’s mural features the Abbott family’s 1929 two-tone Studebaker with wooden spokes pulling up to the pharmacy window. William Abbott relocated to Sunnyslope from Michigan in the 1920s due to poor health and a lung illness, and set up camp at the base of S Mountain. He was later joined by his wife and eight children. “People back then knew it was the Abbott family driving through town by the number of feet hanging out the window,” recalls Tommy Abbott, the youngest son. It was that memory that inspired the theme of the mural. Medina spoke to Abbott to get more details about the car, and found an image online that he could use as a model. The mural was a collaborative project between the Sunnyslope Historical Society Museum and the City of Phoenix Arts & Culture Department, with assistance from the East Sunnyslope Neighborhood Association & Block Watch, and Literacy Volunteers. Medina, Abbott, and representatives of the partner organizations will be on hand for the launch event. A light lunch will be served afterward. The event is free and open to the public. For more information, call the museum at 602-331-3150.